Peacock Butterfly sipping nectar from Verbena bonariensis flowers. The Peacock Butterfly (Inachis io) is easily recognised with the striking eyespot markings on its wings, these are designed to frighten predators. Males and females are similar in markings, but the female is slightly larger with a wingspan between 65 and 75mm. 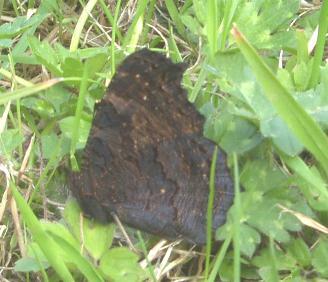 The underside of the wing is dull brown with a feint pattern. The closed wings are much less noticeable. There is one generation in a year. The males are territorial, setting up their patch at the edge of wooded areas when they emerge from hibernation in the spring. They see off rival males and persue passing females. After mating the eggs are laid on stinging nettles where they hatch into black, spiney caterpillars up to 40mm long. By May the adults from the previous year will have died off. The caterpillars of the new generation pupate in July and the new adults emerge shortly after. 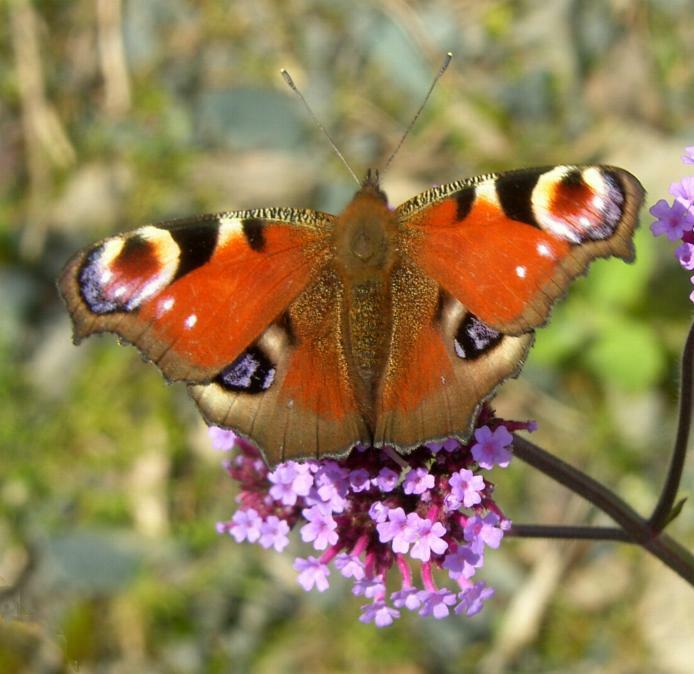 They can be seen sipping on the nectar of many plants, especially Buddleja, Hebe and Sedum. In September they go into hibernation to avoid the winter weather.